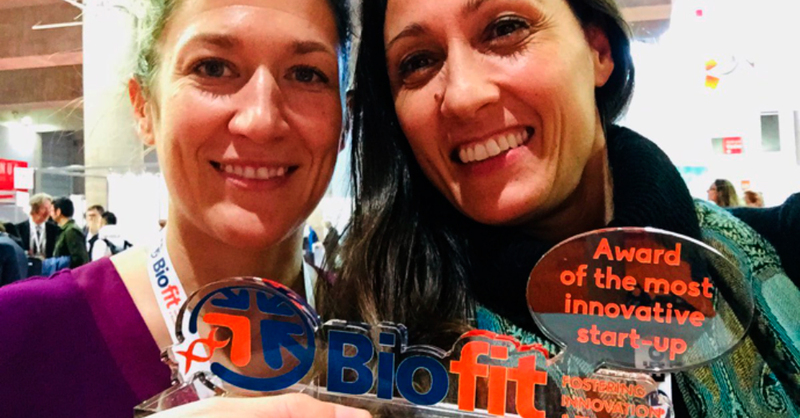 CEO Laura Soucek and CSO Marie-Eve Beaulieu took home yet another award for Peptomyc, this time with success at BioFIT 2018 for the most innovative start-up. BioFIT is the leading partnering event in Europe for technology transfer and early-stage innovation in life sciences as well as being the ‘marketplace’ for investment in life sciences. The award was presented at the 7th BioFIT in Lille on December 6th. Over 1300 international attendees and representatives from 300 start-ups watched 80 of them present their projects in order to attract investors and partners. Of these, 20 of the most promising were selected by a jury of international experts and had the opportunity to pitch for early-stage investment. Two start-ups were chosen to share the title of “Most Innovative Life Sciences Start-up of 2018”, and Peptomyc is proud to bring home another award.